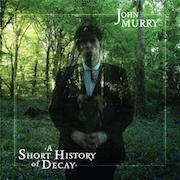 Everything about John Murry is blurred. From the Southern Gothic backstory to the near-death drug overdose to the recurring cycle of tragedy and redemption, right down to the cover photograph of this second album A Short History Of Decay – fading, ghost-like, into a forest - to the songs themselves and the mumbling baritone in which they are delivered. Everything is hazy, indistinct, on the brink of disintegration, much like its maker - a man adopted at birth into the family of William Faulkner, steeped in poetry, literature and whiskey, and raised in Tupelo, Mississippi, in the shadow of slavery, civil war and Elvis Presley. Nick Cave once sang about Tupelo (“Distant thunder rumble/Rumble hungry like the beast”) and there is more than a touch of Cave’s brooding darkness about Murry, whose rumbling voice and preoccupation with mortality place him in a genre somewhere between Mark Lanegan and Mark Linkous. A Short History Of Decay is raw, honest and painful: listening to its 10 songs feels like intruding on someone’s personal grief. Even a glance at the titles screams caution: ‘Under A Darker Moon,’ ‘One Day (You’ll Die)’, ‘What Jail Is Like’ and ‘Defacing Sunday Bulletins’. But first the backstory: Murry’s undiagnosed autism led to troubles at an early age, which led to prescribed medication, which led to unprescribed medication, which led to being institutionalised for addiction and mental-health issues. Eventually discarded on to the streets of Memphis, music became the one constant positive source in his life. Memphis led to San Francisco and San Francisco led to heroin and heroin led to a near fatal overdose on the corner of 16th and Mission, harrowingly memorialised in his song ‘Little Colored Balloons’.” But that was only Chapter 1. Music came to his rescue and led him to Tim Mooney of American Music Club and the group of musicians who helped him create his 2012 album The Graceless Age, a work of startling originality that was matched by live performances of devastating intensity: the raw honesty in Murry’s performances, on record and onstage, is almost too hard to bear. For him, you feel, it’s not just therapeutic – it’s required in order to survive. And then... just as redemption arrived, Mooney died suddenly and unexpectedly and Murry’s world fell back into chaos, losing his wife, his daughter, his freedom – temporarily – and ultimately his country, over the next few years. But salvation would reappear, in the shape of another muse and musician, Michael Timmins of Cowboy Junkies, who talked him into a return to the studio, this time in Toronto, with an ad hoc band of his brother Peter Timmins, also of Cowboy Junkies, on drums, Josh Finlayson (Skydiggers, Gord Downie, Lee Harvey Osmond) on bass and John’s friend Cat O’Riordan (The Pogues, Elvis Costello), who he met in his new adopted home country of Ireland. Recorded over the course of just five days, with the musicians responding to Murry’s songs by instinct, it’s a devastating document of a man teetering on the brink of disintegration, stepping back from it to survey the wreckage, and starting again. Musically, it’s loose-limbed and sprawling: songs range from stark, simple affairs that shuffle and shimmer (‘Silver Or Lead’), sinister stories of “black Cadillacs and bloodshot eyes” (‘When God Walks In’) , and throbbing ballads (‘What Jail Is Like’) to chugging grungey rock’n’roll (‘Under A Darker Moon’, ‘Defacing Sunday Bulletins’) and wheezing Waits-like affairs (‘Wrong Man’) that must once have started out somewhere in a steamy, swampy backwater below the Mason-Dixon line before taking a wrong turn and emerging, like the bluesmen who travelled from the Delta to Chicago, as some sort of warped hybrid of Americana and the blues. It would be a brave listener who tried to categorise Murry’s music; a braver one who would pigeonhole a songwriter who rarely strikes an optimistic note but, when he does, it’s in the oddly uplifting chorus of a song with the title ‘One Day (You’ll Die)’. In another sense though, it’s pure Americana: music rooted in the tradition of folk, country, blues and rock, drawing on a heritage and culture familiar through nearly 100 years of film and music. It’s also the Southern Gothic novel Murry might have written had he followed his family’s path.